Uno de los mejores cazas biplanos de los años 30. Sirvió hasta el final de 1941. 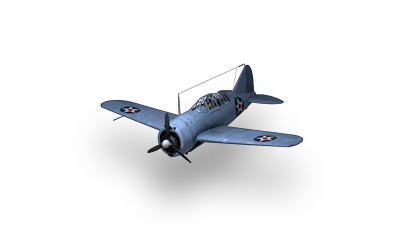 This plane is very similar to its parent, the F2F. The transition between the two is a easy one. Still mid maneuverability but it has decent guns. And on top of that, two 100 lb bombs to take out ground targets. After mounting the bigger 12.7mm machine guns, you will notice a more satisfying punch. But its overall damage is less than the Hawk 75, the tier three american army plane. Nothing has to be purchased to mount anything, so go where you like.